GRS-16 PE Parallel Edge Guide Rail Square - TSO Products LLC. In stock! Orders placed today will ship within one business day. Worldwide shipping available to all destinations outside the United States! Introducing the newest version of the best-selling guide rail square on the market: the GRS-16 PE. Like its sibling GRS-16, the GRS-16 PE is designed to make it much faster to achieve dead square cuts with your FESTOOL, MAKITA or TRITON track saw—but adds a second "parallel edge" to permit squaring against the front and back of your workpiece. Before the GRS-16 family, accessories for squaring up your track saw guide rail relied on the loose-tolerance T-slot found on just about every guide rail. To overcome this inherent inaccuracy, you had to rely on a separate reference square, plus a combination of loose parts like T-bars, hex bolts, knobs or wingnuts. No longer! The patent-pending GRS-16 PE is completely self-contained and self-aligning, thanks to an innovative, high strength integral draw latch mechanism. Simply slide the GRS-16 PE onto your guide rail, lock the draw latch, and you're done. Five seconds to square. Accurate cuts with your track saw often require using a screw clamp or quick clamp. For this reason, we've designed notches in both reference edges of the GRS-16 PE to accommodate popular clamps like the Festool Screw Clamp or Quick Clamp. The GRS-16 PE is precision CNC machined from a single piece of 5/8" (15 mm) thick 6061-T6 aluminum and then anodized for a non-marring, high durability finish. The high-strength draw latch is built from stainless steel—to resist rust and pitting over time—and features a resilient, grippy, non-marring coating on the latch hook. Despite its high clamping strength, a comfort coating on the latch handle makes it easy to generate the leverage necessary to engage, release or reposition the square along your length of track. The GRS-16 is made in the United States, and comes with our lifetime warranty. We have added the ability to connect the GRS-16 PE to the MFT/3 guide rail hing bracket! The time-consuming re-squaring process of the MFT guide rail is now a thing of the past with the newest GRS-16 PE. Rail squareness is now assured, unaffected by varying material thickness and rail height adjustment. The inspiration for this improvement came from customer Simon H., a Festool MFT/3 user in the UK. We listened and acted on it. Thank you, Simon! We engineered this feature to keep the kerf line in exactly the same location as your standard MFT/3. You can quickly change back to the original MFT/3 arrangement any time. Already own a GRS-16 PE? We've got more good news! Notice the the M6 tapped holes in the right side – they line up and match the MFT/3 hinge bracket mounting holes. Connection and removal is a snap. In keeping with our policy of making new features backward compatible whenever practical, you can add this feature to your existing GRS-16 PE tool using instructions and a pattern available for free download from our “Plans” section right now. This feature is not technically possible for use on the GRS-16. Quick video walkthrough of the original GRS-16 PE. Special thanks to Eric at The Poplar Shop for his unexpected video review of the original GRS-16! Got a suggestion to make this page even better? Your feedback and suggestions are always welcome! The TSO Products GRS-16 is Patent Pending. TSO Products reserves the right to change specification of products without notice. Standard equipment and specifications may differ from country to country. Some products published here may not be sold in your country. Printed materials may not be current, so always check the TSO Products website for the most up-to-date product information. FESTOOL is a Trademark of FESTOOL Tool Technic Tanos. We stand by the GRS-16PE with a lifetime warranty! TSO Products GRS-16 Guide Rail Square. Quick review. I wish I would have purchased this a long time ago. Accurate and simple to use with tracks, and great addition to MFT table. Must have accessory for track saw work flow. 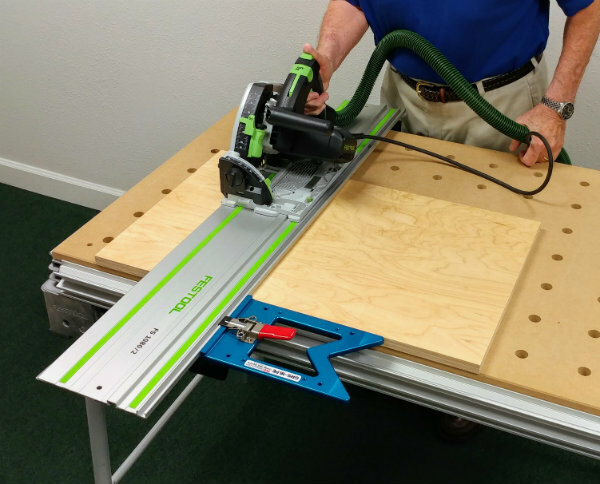 Turn any work surface into a Festool MFT3 by adding t track stop for repeatable cuts. Very accurate results. This thing is so quick and easy to use and it’s dead on accurate. What else can anybody ask for in a tool! I’ve had other rail squares and hands down this one is the best and so is TSO. I had a minor cosmetic issue and they immediately replaced my square. I have checked the GRS on three rails in multiple locations along the rails and perfect 90 degree cuts. 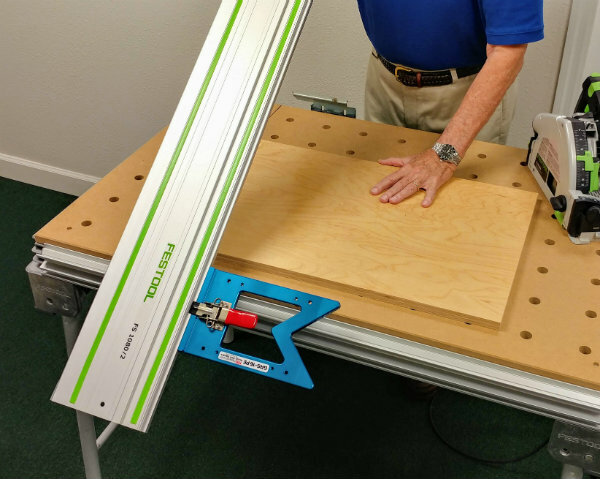 Easy to installl, remove, and store in the saws sustainer. I bought the PE since sometimes you can hold the square against the work piece easier by pulling. I previously purchased the GRS 16 about 2 years ago and loved the product. I decided to upgrade because it allows you to cut from from either with changing the guide rail. I wish I would have purchase it from the start. Lots of ways to square your Festool guide rail. But this way is THE way. Product is beautiful, shipping was fast, and the added bonus of eco-friendly packaging was a nice cherry on top. Thanks for being a great company! Great tool! Very well made! This has helped me alot at breaking down sheets of plywood. I don't have much room in my shop .Now I can have square accurate cuts with out dealing with my crapper table saw. Worth the money!